Can New York’s steel-and-glass glamour measure up to the romanticism of Paris? It depends. Certainly, the corporate buildings spiraling skyward above the streets of New York, their heads lost in the clouds, lack the magnificence and refinement of the Beaux Art and Neo-Classical buildings and monuments in Paris. But is there anything about New York that approximates the allure of Paris? If so, what? I agree, and hSophie Delafontaine, the Longchamp artistic director—a Parisian resident and a frequent visitor to New York—has been quoted recently as saying “You can have Parisian moments anywhere.” She knows whereof she speaks. I agree, and here’s why. It’s all about attitude and style, about a state of mind. A philosophy with which your trusty correspondent, Desperately Seeking Paris, finds herself completely in accord. You just have to know where to look. And when you go looking, it’s imperative to bring a soupçon of French style and attitude along with you. 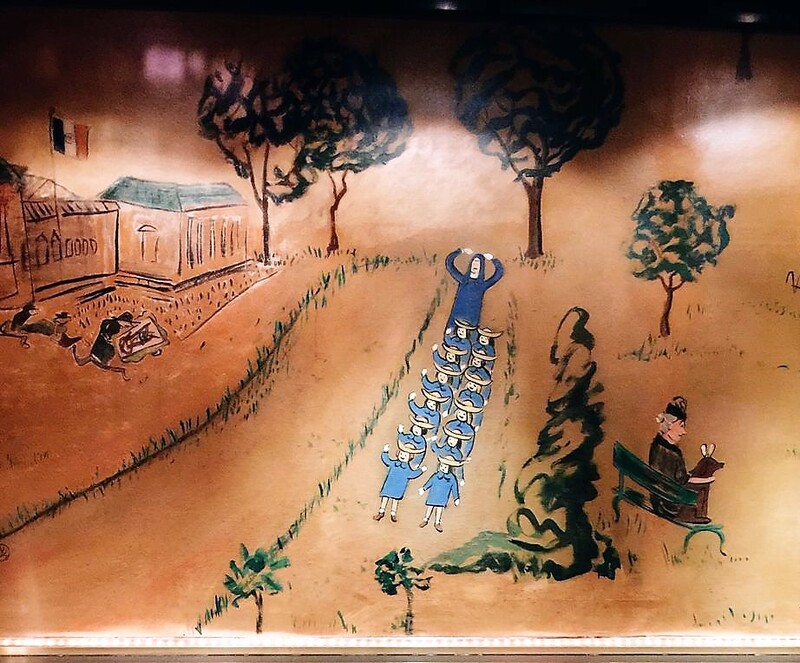 This week we found our Parisian moment at the one-of-a-kind Bemelmans Bar, on the ground-floor level of the Carlyle Hotel at the corner of 76th Street and Madison Avenue. Arriving around 4:45 PM to a packed house, I commented to the white-jacketed waiter that happy hour was starting early. He replied: Happy hour starts around two o’clock. That day, as my small contribution to French style in New York, I brought along a vintage (1930s) alligator handbag purchased many years ago at ‘Les Puces,’ the flea market on the northern outskirts of Paris. Perfect for plunking down on a small Art Deco table. Robert Mosco Performing 5:30 p.m. to 8:30 p.m.
We chose a Domaine Seguinot Bordet, a 2016 Chablis from France—a lovely medium-bodied fruity white. Waiting for our drinks to arrive, we had a ringside table next to the Steinway piano in the middle of the room. A perfect vantage for watching Robert Mosci, a talented and congenial piano player, getting his part of the room in readiness. Beginning at 5:30 PM there’s live music in the bar. Requests accepted. And there were many. While the drinks are exceptional and the wines by the glass excellent, the décor of the warm and inviting room is the main draw. The bar is named for the author and illustrator Ludwig Bemelmans—beloved for his books about Madeline. After WW2, he was invited to create wraparound-the-room murals of Central Park, in exchange for free rent at the Carlyle. He worked on the project for eighteen months. Not a bad deal. (You can see Madeline and her classmates above.) For 72 years, the hotel has preserved and restored his legacy, with nicotine damage once a major concern. The drinks were expensive, with the bill for three glasses coming to $68.59, before the tip. But well worth it, and here’s why. The Hotel Carlyle Dining Room…O, so French! The late afternoon experience of being whisked away to a more sophisticated time, of listening to live music, and of seeing the only public display in the world of Bemelmans’ artwork was a most welcome diversion. A perfect Parisian moment marked by the beauty and elegance and style for which that city is known. And it happened here in New York. That’s it for this week, Mesdames et Messieurs. Should you be coming to New York, be sure to put Bemelmens Bar on your must-see list. So, too, the Carlyle’s magnificent main dining room to the left. It’s beginning to feel like spring on Park Avenue. This week, our gardeners were here and left behind a bevy of lavender pansies and clutches of tulips. Have you a friend coming to New York? Then, take a second to share the news. As we say, sharing is caring…Merci beaucoup.